This article is about the Zhou Dynasty state. For the Three Kingdoms period state, see Eastern Wu. For the Five Dynasties and Ten Kingdoms Period state, see Wu (Ten Kingdoms). For the 2004 gangster movie, see Jiang Hu (2004 film). Wu (Chinese: 吳; Old Chinese: *ŋʷˤa) was one of the states during the Western Zhou Dynasty and the Spring and Autumn period. It was also known as Gouwu (勾吳) or Gongwu (工吳) from the pronunciation of the local language. Wu was located at the mouth of the Yangtze River east of the State of Chu. Its first capital was at Meili (probably in modern Wuxi) and was later moved to Gusu (within modern Suzhou) and then Helu City (the old town of present-day Suzhou). The rulers of the State of Wu had the surname Ji (姬), the same as the Zhou royal family. According to the Records of the Grand Historian, this was because the rulers of Wu are descended from Taibo, the elder uncle of King Wen. Realizing that his youngest brother, Jili, was wiser than he and deserved to inherit the throne, Taibo fled to Wu and settled there with his other brother Zhongyong. They established their first capital at Meili (梅里), believed to be today's Meicun in Wuxi. The State of Jin aided Wu's rise to power as a useful ally against the State of Chu. In 584 BC, Wu rebelled against Chu upon the advice of Wuchen, a Jin minister who defected from Chu. Afterwards, Wu would be a constant threat to the Chu until its demise. Wu fomented rebelliousness among Chu's vassals in the Yangtze valley. In 506 BC, Wu launched a surprise attack and occupied the capital of Chu. Afterwards, Wu was briefly the most powerful nation and turned to other campaigns, defeating the State of Qi in 484 BC. Ironically, Wu was later threatened by an upstart state to its own south, Yue; Chu then aided Yue's rise as a counter to Wu. Although Wu won a major victory against Yue in 494 BC, it failed to completely subjugate it, in part because of Yue's timely bribing of an important Wu minister. While Wu was engaged in a military campaign in the north, Yue launched a surprise attack on Wu in 482 BC and conquered the capital. Over the next decade, Wu was unable to recover and Yue absorbed the state in 473 BC. 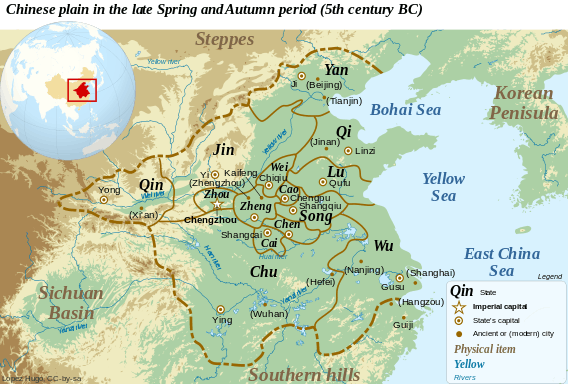 Wu, Yue, and Chu all proclaimed themselves kings in the 6th century BC, showing the drastic weakening of the Zhou court's authority during the Spring and Autumn period. Wu and Yue were masters of metallurgy, fabricating excellent swords with incised messages, geometric patterns, and inlaid gold or silver. Wu and Yue swords tend to use much more tin than copper compared to those of other states. Wu often sent swords as gifts to northern states, such as Qi and Cai. Examples include the spearhead of King Fuchai and the sword of Prince Guang. The kings of Wu claimed descent from Wu Taibo, the uncle of King Wen of Zhou. Their ancestral name was Ji and their clan name was Gufa. The Records of the Grand Historian states that the people in Wu wore their hair short and sported tattoos. This observation is likely meant to illustrate their supposed barbarism, as in Sima Qian's time neither men nor women were allowed to cut their hair or otherwise modify their body - doing so was considered an offence against the ancestors from which one had inherited one's physical features. Wu rulers did not receive Chinese-language posthumous names after death. As Sun Zi served under King Helü, his Art of War was possibly written or edited in Wu. "Wu" continues to be used as a name for the region around Suzhou and Shanghai and their regional speech, Wu Chinese. It was employed by other states and princes holding power in the region, most notably Eastern Wu of the Three Kingdoms, and Wu and Wuyue of the Ten Kingdoms. Ambassadorial visits to Japan by the later Chinese dynasties Wei and Jin recorded that the Wō people of Japan claimed to be descendants of Taibo of Wu, traditionally believed to be the founder of Wu. Wu, together with Yue, is represented with the star Zeta Aquilae in asterism Left Wall, Heavenly Market enclosure (see Chinese constellations).